First time in Previews UK! 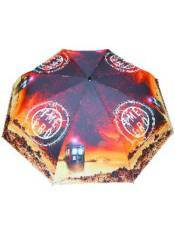 With the British Summer fading fast these fantastic high quality Doctor Who umbrellas are ideal for keeping the rain (or the last drop of sun!) off your back. They are ideal for Whovians and fans of keeping dry everywhere and you can choose from a TARDIS Stick Umbrella (with a fibre glass frame, an auto open feature and a 21 inch canopy size) or a Time Lord Folding Umbrella (which is auto open and auto close).